The designer brown and white boxes lend an elegant feel to our Something for Everyone tower. 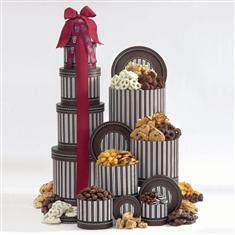 This impressive 24" tower is filled with over 4 pounds of goodies. It makes a great office gift. Included are; French chocolate truffles, milk chocolate covered pretzels, white chocolate covered pretzels, chocolate covered peanuts, chocolate chip cookies, peanut brittle squares, carmel corn crunch, cinnamon apple crisps, chocolate filled peppermints, chocolate covered almonds and chocolate filled wafers. Additional shipping charges may apply during warm weather months.